cut-throat on 1-100 Strike Freedom...some shop is selling at RM150 at eBay. the good-old RX-78-2...i think there is many version of MG itself. Forget about the old version 1, which is RX-78-2 and G3...not worthy. Version 1.5 either u can get the RX-78-2 or Char ver, basically the same. this kit is a great improvement over the version 1. 20th annivesary version--u can get it if u dun plan to paint and u like chrome gundam. ver-ka, it look more "square" and "muscular". no much comments on it. then Plamo-Kyoshiro(typo) version or Perfect Gundam, this kit is selling very cheap at HK(if u can get it). This kit although had less panel-line and posebility but is the closest match to the anime version, or the HGUC version. the latest of coz is the OYW-version, the posebility got improvement over the shoulder, waist and feet area. panel-line is superb!! the manual instruction is Full-Color not more black-white. but this kit dun have beam javelin and core fighter. as bang for buck-i think ver1.5 is great. if u got extra-bucks then OYW-ver is u choice, u won't regret it. Ver1.5 when compare to Ver KA i personally choose Ver Ka as ver 1.5 one look thiner and not that LengZai to me lah, some more KA one got more sticker leh.....but 2 of them also don't have movable fingers, right? their finger setting is 1+1+3, right? hey.. what i mean is a posting that actually relates to this topic..
sorry loh.. 8-) tak han cheng lei yam cha! HG Infinite Justice Gundam is out by XL! check the announcement! which is by far the most lengcai MS in GSD so far! way to go Athrun! 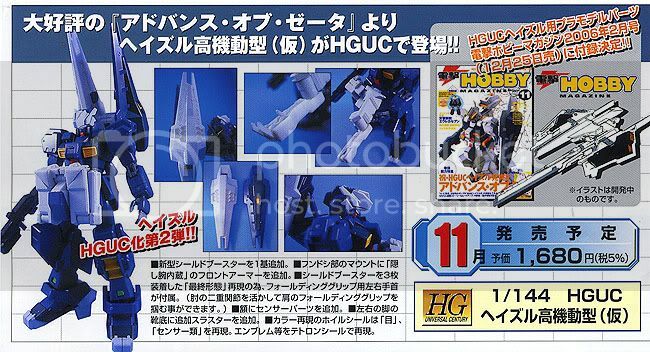 Destiny Gundam in HG 1/144! comes with stand & the wings of light! better deal than the 1/100? it is confirmed that MG-Zeta 2.0 gonna be release in 2005 December with price around 5000+yen. I want to comment on the recent HGUC Hazel Kit. At a amazingly cheap price of 1300yen, BANDAI did a very good job in rewarding the fans of AOZ...thanks to the monitoring pressure of Dengeki Hobby Magazines, pressure from the readers and the creator of Hazel itslef, they came out with a very good product. Very poseable, good ABS forming color, and improvement in joints and hand parts. Hazel HIgh Maneauver will be out in November (price 1500yen this time). With this second Hazel(in dark blue this time), you can finally collected 3 boostered shield, and the sub-arm armenment for Hazel Custom(transfer from the second hazel kit to fit on your first Hazel Custom). Dengeki is giving away some supplementary armenment parts for Hazel in its FebruaryIssue which will be out at the end of December (no DHM in Jan, that's the norm).